By recycling old pallets into something new, the gardener is putting less waste into landfills or lessening the need for burning materials in their yards. According to the WebEcoist, customizing wood pallets to create other usable items is not difficult. Choose the projects that you would like to work on. Use sturdy pallets to create compost bins, for example. Draw out the plans to have three or fours sides, nailed together at the corners. Placing another pallet loosely over the top of a four-sided bin will help to keep critters out. Plan what projects to work on with the less sturdy pallets as well. 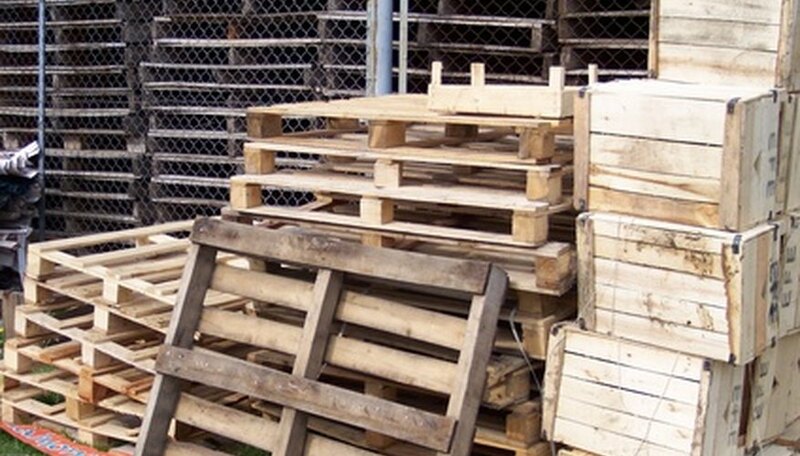 Take apart any pallets that won't be used intact. Do this carefully with the claw of a hammer. Reserve nails to be used on future projects. Saw off ends of wood slats that are no good. Wear safety goggles when using a saw. Work gloves protect your hands, too. Begin building items that will be used in the garden area. Create items such as tables, stands, planters and raised beds using the materials that have been saved from taking apart the pallets. Buy more nails, if necessary, and any other materials you'll need to complete the job. Sand the edges of the wood when projects are done to smooth them out. Run your hand over other areas of the wood to determine whether those areas need sanding as well. Be sure that there are no splinters to rough areas for people to scrape themselves on. Paint or stain items that you want to last, after stirring the medium with a stick or wooden slat. Doing so will protect the wooden items from the weather. Understand, too, that painting or staining may have to be redone seasonally. Choose colors or shades that match the surroundings, such as the trim on the house or the colors within the garden itself. Stencil designs on the tops or edges of tables and stands to make them more interesting. You can also give the items an aged effect by rubbing sandpaper lightly over the paint in some areas. Crackling is another technique for aging wood projects. Do this by first painting the wood, then adding the crackle medium.